This animation shows Phobos as a large white dot against a black background, representing Phobos, moving from the lower center toward the upward right corner. Above and to the left of it is Deimos, a smaller white dot, that also moves upward and to the right but at a much slower pace. In fact, Phobos starts out below Deimos, the smaller dot, and quickly moves past it in the sequence. 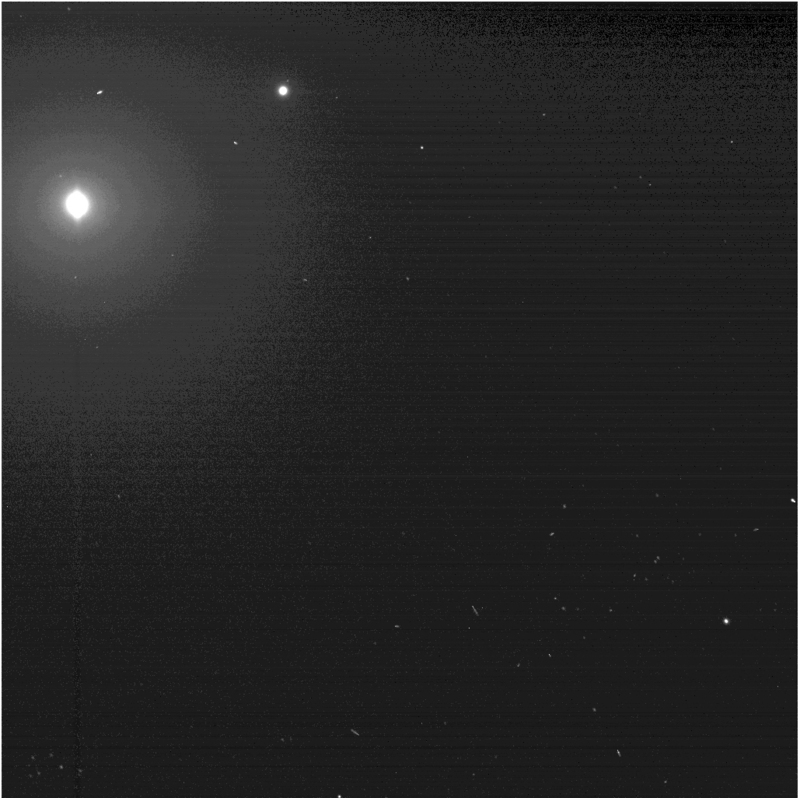 This animation shows a large white dot against a black background, representing Phobos, moving from the lower center toward the upward right corner. Above and to the left of it is a smaller white dot, representing Deimos, that also moves upward and to the right but at a much slower pace. 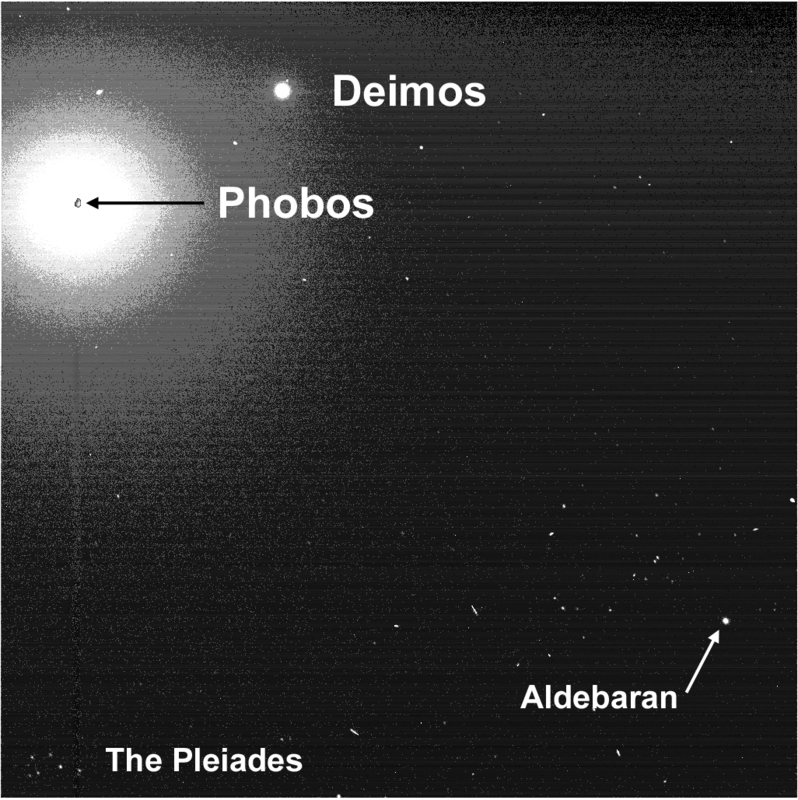 This image shows on the upper right side, is a small white circle against a black background representing Phobos, with a smaller black circle representing Deimos a little above and to the right of it. See the Spirit Press Release for additional information. This sequence of images shows the rough outline of Phobos, fuzzy on the left, becoming gradually sharper in two successive images to the right. The fourth image, on the far right, is a much closer image taken from orbit around Mars by the Mars Express. It shows a bumpy, crater surface, with a circular portion missing from the upper right limb.